We all know very well that the internet is wonderful and one of the best places for all those who seek knowledge. If one of your goals for this year is to learn something new, then let me clarify that on the internet you have all kinds of options, and in a huge number of cases, you will not have to pay a single penny for learning new things. The internet is wonderful and one of the best places for all those who seek knowledge. If one of your goals for this year is to learn something new, then let me clarify that on the internet you have all kinds of options, and in a huge number of cases, you will not have to pay a single penny for learning new things. 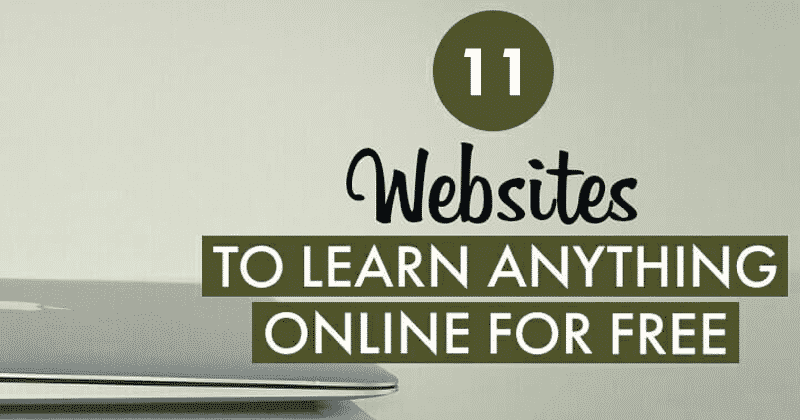 Hence, below here in this post, we have mentioned 20 websites where you can get free education and training to learn new things, yes, it means now you can learn whatever you want. So, now without wasting much time let’s get started and explore the whole list that we have mentioned below. In this well-known platform, of course, Udemy more than 35 thousand courses are waiting for you to learn at your own pace and not only that even this platform also gives you the freedom to learn from any device. If you are searching for something open, then let me clarify that it is one of the best online learning portals where you can take open online courses offered by some of the best universities in the world like MIT, Harvard, Berkeley and much more. It is one of the best online portals with more than 1000 classes to learn cooking, painting, paper craft and much more, in short, you can simply learn whatever you want and all for free. Instructable is one of the best portals of its category and king of the “do it yourself” on the Internet. As here you can get detailed instructions that are created by the same community to build all kinds of things. If you are interested in cooking then Cooksmarts will be the perfect option for you, as it is one of the best portals to get all the basic cooking skills in several perfect cooking lessons at home. Collects lessons built around an original TED-Ed, a TED Talk through YouTube videos and not only that even in this well-known informative platform you can learn and find all types of contents. Khan Academy is one of the well-known and best online learning portals where you can learn almost anything, at your own pace, with interactive exercises, and the most interesting thing about this portal is that everything is available completely for free. It is one of the best portals for learners, as this platform offers short lessons that are created by the community to learn all kinds of new things with which anyone can simply polish or perfect their skills. The well-known OpenLearn learning platform is the home of open education where anyone can take free courses offered by the well-known Open University. In the well-known FutureLearn learning platform join more than 3 million people who take free courses created by well-known and popular universities and experts from around the world. Degreed is one of the best and well-known learning platforms which simply helps you to keep track of the best materials available on all the free learning platforms on the Internet, hence, here you just have to choose the subject and focus according to your needs. So, what do you think about this? Simply share all your views and thoughts in the comment section below. And if you liked this top list then simply do not forget to share this post with your friends and family.